This post has been updated. Originally published October 17, 2006. After heading down countless dead-end alleys and hitting walls in her search for the history of red velvet cake, frustrated reader Cathy Nolan turned to us. Because of this story, and similar variations, Red Velvet Cake is also known as Waldorf-Astoria Cake, $100 Cake, $200 Cake, etc. There’s also a scientific myth associated with Red Velvet Cake. It has sometimes been asserted that the cake’s red color comes from a chemical reaction between the baking soda and the chocolate in the recipe. This is the result of a simple misunderstanding of the chemistry involved. While cocoa powder contains anthocyanins (red vegetable pigments) they are only red in the presence of acids –they turn blue-green in the presence of bases. When cocoa is mixed with the baking soda, a base, the combination should turn the cake an unappetizing brownish-gray. It doesn’t, of course, because the anthocyanins are present in very small quantities, and any color shift is masked by the more prominent brown of the chocolate. The red color of the cake comes from a much simpler source: large amounts red food coloring. The supposed red color resulting from the baking soda/cocoa combination also appears in connection with Devil’s Food Cake. I wonder if Red Velvet Cake was created because Devil’s Food Cake doesn’t look nearly as red as its name would suggest. This is akin to some folks adding green food coloring to Key Lime Pie because it doesn’t appear “limey” enough. Beard, James and Thollander, Earl. James Beard’s American Cookery. New York, Budget Book, 1996. Brunvand, Jan Harold. The Vanishing Hitchhiker: American Urban Legends and Their Meanings. New York: W. W. Norton & Company, 1989. McGee, Harold. On Food and Cooking: The Science and Lore of the Kitchen. New York: Scribner, 1997, (rev. 12004). Photo © 2011 Kate Whitaker. All rights reserved. All recipes and photos used with permission of the publisher. Dear Gary, thanks for the information on the chemistry of cocoa and baking soda. It’s also often said that natural cocoa powder can be leavened with baking soda while Dutched/alkalized will have no reaction with baking soda, thus requiring the use of baking powder. From what you said about the insignificant quantity of anthocyanins in cocoa powder, it seems that, in reality, natural and alkalized cocoas probably act mostly in the same way. Is that correct? Thanks in advance! I think we’re talking about two different issues. Anthocyanins are pigments, and have little or no effect on leavening. For baking soda to work (release CO2), it requires the presence of an acid. You can see this easily by dissolving some in plain water. You’ll see little or no bubbles. Add a small amount of vinegar and watch out! Normal, unDutched cocoa is slightly acidic, so it could react with baking soda in a similar way, albeit more gently. Dutched cocoa has been treated with an alkaline substance that renders it chemically neutral or even alkaline — so it no longer contains an acid to react with the baking soda. This may be more chemistry than you wanted — but, if not, you can read more here. The chemical reaction in red velvet cake is between natural (not Dutch-processed) cocoa powder and either buttermilk or vinegar. Most modern recipes call for sour cream instead, which doesn’t result in a very red cake. Find a recipe that calls for buttermilk or vinegar (but no red dye). Don’t expect a fire-engine red cake, though. It’s more a deep red-brown–but definitely red. Incidentally, if you use natural cocoa, the same reaction can be seen in the Moosewood 6-Minute Chocolate Cake, which is not a red velvet cake but does include vinegar. I recommend using Trader Joe’s natural cocoa powder. Thanks for the info, Staci! This story is in error. The first Red Velvet cake was made with Dutched cocoa and baking SODA. The flour was from soft winter wheat. White vinegar was used to bubble and leaven the cake. It was named velvet because the leavening action of the vinegar reaction creates many more, and finer, bubbles, creating a fine, delicate texture. Vinegar turned the cocoa a SLIGHT HUE of red. The cake was NOT actually red. The original used BUTTER CREAM frosting. I am a Certified Professional Chef and Culinary Historian and promote accuracy. David, thanks for your comment. Can you provide references? We may rewrite this post, and any help you can offer would be greatly appreciated. I found this very interesting! I have often wondered the origin of the Red velvet cake. I read on other posts on different blogs that the cake has a more southern tradition than a New York one. Either way, it can be a delicious cake when made well! I have not tried this recipe but I think red velvet cake is horrible! All I can imagine is the taste of red dye!!! I looked up the history as I thought it would have been a really old recipe that used tomatoes or beets in the cake. Why would red dye make a cake taste good??? That’s a curious question, Sue! All cakes should taste great. That’s why we’re especially glad Bea Vo’s recipe doesn’t use artificial red dye–you still get that beautiful color without a funky taste. It might just change your stance on red velvet cake, too! Sorry you are closed minded. Because. You would more than likely. Love it. ? There is such a difference in flavor between the Waldorf-Astoria Hotel – red cake and what is currently being sold as a ‘Red Velvet Cake’. The Waldorf-Astoria cake is buttermilk and shortening based recipe that lends its flavor to a whole different sensation than the red dyed chocolate cake being sold as ‘Red Velvet Cake’. The icing between the two also contributes greatly to the vast difference between the two. The Waldorf-Astoria cake icing has a flour and shortening roux base which can take some experience to master. The Waldorf-Astoria red cake has been a family staple for decades and will never be replaced by the current versions of the ‘Red Velvet Cake’ in our family as we are thrilled and biased to the flavor and smoothness of the original Waldorf-Astoria red cake. Thank you so much, Katrina, for sharing this. 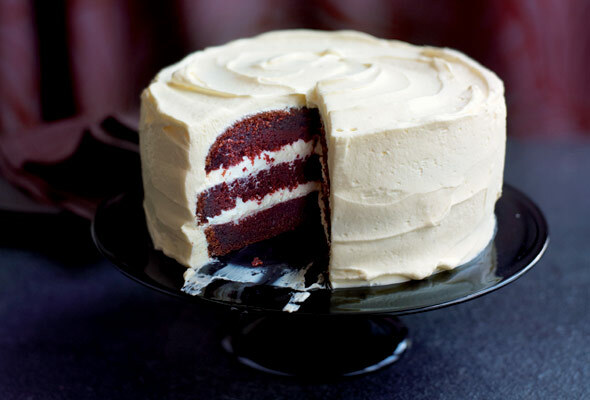 Stella Parks in the October 2, 2011, issue of GiltTaste tells the true story of Red Velvet Cake. Velvet cakes, named for their fine-texture, go back to at least 1873. Red Velvet Cakes came about in the depression era and were “invented” by John A. Adams, the owner of Adams Extract Company. To bump up sales he added 2 bottles of red dye to a cake recipe (along with vanilla and butter flavoring) and exhibited a large photo of the cake at his displays in groceries in the Midwest and parts of the South. The cake became a sensation. Thanks, Greg. That could very well be true! Although we are still a little hesitant to embrace any one story as gospel truth, given that it happened so long ago…. By way of explanation, Jay, I guess my background as a newspaper writer and editor has me hesitant to state anything as fact that I haven’t thoroughly vetted myself. But I see what you’re saying and yes, even so long ago things were dated. Very happy to consider this as very likely story the story of how it all began! Food coloring doesn’t have any taste, or you can use beets, but that takes forever. Even if you don’t “dye” it at all, it still tastes the same with cream cheese icing. Name it “velvet cake” and call it a day. To my understanding in the origin of the red velvet cake it came from Russia. The people there at that time were limited on what they could have and buy. They would save their scraps of breads, rolls or other things that could be used. When there was enough it was combined together and mixed with even some vodka and the other ingredients in order to make a cake. Red food coloring was used to make the combination more appealing so the different colors of the natural colors would not show. This became a recipe used often for all birthdays, holidays, and celebrations. This story was passed down to me from my mother who would have been 85. That’s a really interesting twist, Darcy… the connection with beets has often been made, and Russians DO like their beets. Any idea where your mother heard the story? Virtually all of the earliest references to the cake point to the American south as its birthplace, but I suspect the true origin will always be a mystery (unless a recipe is discovered in a hidden chamber in one of the pyramids). Well, my mother received the story from her mother and so on and I believe my grandmother’s maden name is Burgland and my mother’s Malcom and mine Wilson so it is quite possible. Another lil tidbit was that there was an abundunce of red food coloring because it was not used often so it was one of the things on the list of things received with there other stuff monthly as an insult and reminder because it was red as its dictators referred color. So they turned it around. I guess like when life gives you lemons make lemonade. But unfortunately I do not have any absolutes for these findings. Anthocyanins do get redder in the presence of acids, which makes sense. Unfortunately, the acids you mentioned are neutralized by baking soda to produce the leavening CO2. Even the pH remained low enough for that color shift, there’s nowhere near enough anthocyanin in the cocoa to account for the intense coloration of these cakes. Chemistry is certainly involved, but I suspect it occurs primarily in some dyeworks (which, I’m guessing, are not in the South, but in New Jersey — the Garden State where most artificial colors, flavors, and aromas grow best). Susan, I agree the color adds no flavor or flavor appeal. But I think the red and green is festive for the holidays. If you leave out the red dye, how do you get a white or vanilla-looking cake? What happens to all the cocoa powder? Kansas-Kate, it depends. With this recipe, it would be a white cake. But with this recipe, it will be slightly darker, but not a chocolate cake. There’s not enough cocoa for that. So, it was purely a marketing strategy by Adams Extract to get more penny-pinching wives to buy their red food coloring during the Great Depression, and nothing more? And the “Velvet” came from the fine, smooth crumb? Got it. Thanks! I love that the cake in the picture isn’t TOO red, it means there wasn’t a ton of food coloring used! I think you will find that the original recipe includes beetroot for the colour and makes the cake moist. Hello, Tracey. Yes, I’ve heard that. I’ve never made it that way, have you? But it seems as if it’s origins are much more colorless than that. I got this recipe from my mother-in-law back in the 60’s. At that time she was a hair dresser and did a doctor’s wife’s hair. The doctor’s wife went to the Waldorf-Astoria in New York on vacation and she came back with this recipe which the recipe cost was on her bill when she checked out of the hotel. She told my mother-in-law that since it cost her so much that she was going to share it. Since both people are now passed, I cannot confirm this story to be true but I will believe my mother-in-law. She made this cake for every birthday and then my husband had to have it every year, then my two sons and now their children are in the family tradition of red cake for birthdays. Hi, Lou. Unfortunately, that’s an urban myth. You can see the same thing was said about Neiman Marcus chocolate chip cookies, Mrs. Fields cookies, etc. I work at a bakery in NYC and we use apple cider vinegar in our red velvet cake. It creates a chemical reaction with the cocoa powder and voila! It is red! Red velvet cakes seem to be all the rage in 2016 but none of them taste anywhere as good as my home made Red Waldorf cake. Arati, we have a couple red velvet cake recipes on our site. Here are links to both of them for you to decide which you’d like to try…this one and this one. I’ve often wondered about how the cake came about because quite a few of my friends don’t like chocolate cake, but red velvet is their favorite (it’s not nice to confuse the blonde). I always figured that it was a grandmother or a mother who decided to add red food coloring to chocolate cake to get either their grandchildren or child to eat it. Shelley, I love your theory as to the how and why. Makes perfect sense to me! Red Velvet Cake is the most delicious cake ever, I have about three different recipes but buttermilk and cocoa is constant. There are a lot of comments put forth, all sounding oh-so-very authoritative, but without a single one claiming to have actually made the cake themselves, including the original author. Did you people ever track down the truth? I’m assuming this article was posted in very early 2010, as per the date of the first comment, but contrary to the date listed at the top. In the intervening 8½ YEARS, hasn’t anyone (author, website owners, commentators) bothered to actually follow the legendary recipe using buttermilk, natural non-Dutch processed cocoa, and vinegar (word for word, no tweaks, no dye) to definitively find out if the result is indeed reddish and velvety? All this scientific and intellectual conjecture is just that, guesswork, without having actually made the product in question. This should have been done before the article was ever published in the first place, especially in the case of a subject with so much heresay and urban legends attached. I don’t have any more of a reliable answer as to the origin and/or final result of following one of the older, more authentic recipes than when I began. Please clue us in. That is, after all, one of the reasons we patronize this website in the first place. Thanks. Max, thanks for your pointed comment. The article is referring to the cake known as “red velvet cake,” a term coined much, much later than the 1880s. Velvet cakes had been around for quite some time before the red velvet cake took off, but it had a brownish hue, much like a chocolate cake. We didn’t need to test the original recipe because we knew the result–it wouldn’t be anywhere near as red as the cake we now know. It seems as if the cake that became known as red velvet cake appeared in the 1930s, and the Waldorf Astoria played an crucial part in its popularization. You can read a full account of it in this New York Times article.